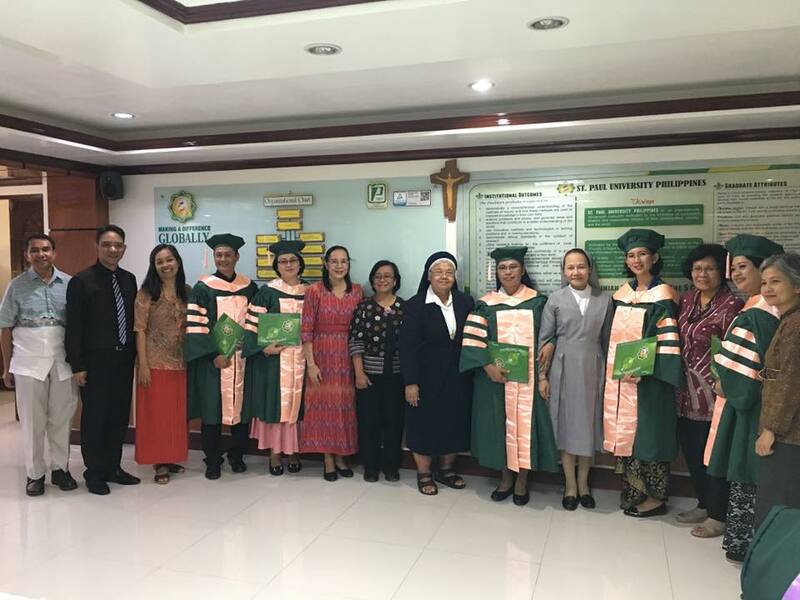 SPUP President, Sister Merceditas Ang, SPC conferred the title of Doctor of Nursing Science to 8 Indonesian nationals during the 14th Mid-Year Commencement Exercises at St. Paul University Philippines on January 26, 2019. Dr. Justina Purwarini Acihayati, Dr. Mestiana Karo, Dr. Indriati Kusumaningsih, Dr. Regina Vidya Trias Novita, Dr. Henny Yohanna Pongantung, Dr. Dewi Prabawati, Dr. Yakobus Siswadi, and Dr. Ignata Yuliati, were conferred the doctoral title after completing all the requirements for graduation including dissertation, international practicum and research presentation in an international conference. Executive Blended Mode of delivery of instruction was utilized for this group of Indonesian Nurse-Professors with 1 month per semester in-campus class contacts and the remaining months were allocated for online discussions, research activities and submission of requirements. Mr. Muhammad Arief Wijaksono and Ms. Kurnia Harli Hasan were also conferred their degrees Master of Arts in Nursing and Master of Science in Nursing respectively during the said event. Both students stayed in the campus for full time studies. These Indonesian graduates are faculty members of SPUP’s partner schools in the Republic of Indonesia.